Can I lay hold on Supply? Is there a formula for Supply? Is it time for Infinite Abundance? Can I learn how to be affluent? Do ideas contribute aught to each other? Why is it so difficult to see Supply as present, available? Are ideas of use to Intelligence? How long will it take to experience Supply? 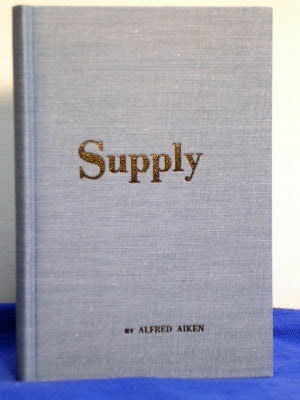 Because of a constant urge that a book on Supply be written, the following pages are available. It is difficult to use words in a new manner, or rather to use them in a manner whereby they will convey a new viewpoint, a concise definition. If the following material requires many readings to clarify the meaning, the effort will be totally justified in the freedom that is certain to dawn, upon comprehension. Lack has dogged the experience of man since his fabled beginning. His first awareness was supposedly one of nakedness, and his use of a mere fig leaf whereby to cover or blanket the condition proved futile then, even as it does today. Lack (nakedness, ignorance) and man are synonymous terms; like the Siamese twins, one cannot survive identification without the other. Obviously, then, it is not our intention to inform "man" how he can obtain or secure riches. Such will never be the experience of man, a mortal, a human -- that is, not in the Absolute sense, the sense of Genuine Reality. Riches are one with Intelligence only, and cannot be divorced therefrom. So long as Job tried to regain what he assumed he had "earned," he but increased his desperation, quite like the prodigal. However, when these two Biblical characters turned entirely from their pursuit of things, to Truth, the Self-I-Am, they were aware of Abundance at hand rather than afar off. This awareness included the riches of Immensity. When the seeking of "things" gives way to the honest admission of Complete Consciousness, Perfect Spirit, Pure Love or Reality-as-It is, one suddenly beholds that he already has all things. The man-sense, the sense of lack, of darkness vanishes. In Truth-Awareness, I-Am-Self-Identification, things are not important even though for ever indelibly within Self- Consciousness. One will never be without things, but it is the Self-I-Am which holds One's entire attention; which is His Joy, Bliss, utter Satisfaction. It is My Self that is Omniaction, Omnipotence, Omniscience, Omnipresence. It is Consciousness that is Life, Value, Truth, Worth, Wealth, the Health-I-Am. Ponder the following, remembering that Wealth is not a "thing" to be earned, but It is That-Which-I-Be; It is Being-in-Action, inclusive of all things. The I-That-I-Am never can be more, and never can have less because I-Am-Undimensional-Wealth, Unlimited-Awareness, Unbounded-Conscious-Intelligence here and now. Beholding Myself-as-I-Am is the sole key to Infinite Supply for Awareness is Substance Itself. Let us read and ponder these pages that we may enjoy what we Be, rather than waste years in foolish servitude to time, to education, to evolution trying to become It; exhaust our "mist"-taken sense of ourselves in violent denial and opposition to our Sole Self. Playing prodigal to the Self-I-Am cannot obliterate, cannot alter or halter that Self for It is Everlasting, without change or variableness, hence the prodigal role is foolishness. To rejoice in what is reveals that we are already at the point of Absolute Perfection wherein there is no wait, no delay, no manana. Now is, and only now. I-Am-What-I-Am NOW. What greater glory can be asked for or experienced? Can there be more than Infinite Perfection? Can I have more than the All-That-I-Am? Do I crave less? Than for what do I wait? Am I willing to enjoy the Utterly Enjoyable Self; to be the Self of Absolute Satisfaction, that Sole Self that I am now?